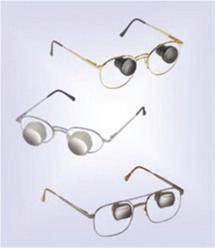 Miniature Binoculars inserted into eyeglasses are called TELESCOPIC SPECTACLES. The patient’s eyeglass prescription, as well as the highest quality optics, must be used in the system for maximum clarity. Telescopic spectacles can be for one eye (monocular) or two eyes (binocular). The telescope can be mounted in various positions in the glasses. At Low Vision Of Southern California we see patients from all over Southern California for Telescopic Eyeglasses. Many of our low vision patients visit us from Riverside County and Orange County CA. Smaller telescopes mounted high in the glasses allow the person to view through either the telescope or the “carrier”, the regular prescription lens, by simply moving the head slightly up or down. Either small or larger telescopes are placed in the center of the frame for tasks not requiring mobility. Two telescopes can be “converged” for use at near when reading or performing fine detailed tasks. Telescopes vary in power, field, weight, focusable and non-focusable. Telescopic optics is very complex. Ideal for patients whose primary occupation deals with near vision tasks such as computer use and reading. Telescopes can be placed in any position and at any angle a task demands. For example, a custom telescope was designed for a student who needed one telescope angled down for reading and writing and the other up for seeing the teacher and the chalkboard. Telescopes vary in power, field, weight, focusable and non-focusable. Telescopic optics is very complex. The knowledge and experience of the doctor in designing and fitting is extremely important in determining what is best for you.Cost varies with the prescription needed in the system and the type of telescopes ordered. This can be discussed during the COMPLIMENTARY TELEPHONE INTERVIEW. Uses will depend on the unique needs of the patient. The knowledge and experience of the doctor in designing and fitting is extremely important in determining what is best for you. Cost varies with the prescription needed in the system and the type of telescopes ordered. This can be discussed during the COMPLIMENTARY TELEPHONE INTERVIEW. Learn about the E-Scoop solution.